When fundraising, I sometimes get so focused on my performance (how much money I raised) that I lose sight on the why. For example, each month, when I review the total I have raised, two reactions either happen. If I am over my target, I am delighted. If I am below my target, I become a nervous wreck. This rollercoaster of emotions happens when I forget about the long term focus and purpose of my work. Yes, hitting targets is important, but when I forget the ‘why,’ I quickly get sidetracked. I get tied into the results, and whether I can relax or not. I should instead keep my attention assessing what I did well and not well, and then move forward. Fundraising isn’t a race. It’s not about a good or great month. It’s not about a great campaign, either. It’s about the constant, slow, consistent efforts you put in, day by day, to share with people the why of your charity. Why you do your work. Why you help people. Why follow Christ. This bigger meaning drives me forward to reach my results. When I maintain this level of execution, I am always more consistent and achieve greater success with my long-term fundraising goals. I hit targets much more regularly and with less stress. How do I maintain this focus on the why? As a Catholic, I do this by reflecting on the mysteries of the Holy Trinity. Yes, by maintaining focus on God the Father, God the Son, and God the Holy Spirit, I fundraise with much more consistency and success. Here are three reflections on the Holy Trinity that have helped me maintain a successful mindset and work ethic in my fundraising. As a fundraiser, your goal is to find donors. Do you find it challenging to be on the receiving end of people’s generosity? I know that I do, but I have learned that reflecting on the Trinity helps me measure this feeling of disparity and recalibrate it. How? Jesus taught us how to receive the Father’s love. This gift was given to us for free. Then, Jesus taught us to give this love to others. This action is how you calibrate those feelings. Jesus is the Beloved. He is loved by the God, the Father. The Holy Spirit is the love that flows between the Father and the Son. However, as all are God, but not the same, the are all the source. Meaning, the Father doesn’t receive back what He first gave to the Son. The Trinity always was, is, and will be. It’s perpetual, never-ending, and overflowing giving. And that’s what we are supposed to do, especially in fundraising before and after we receive gifts. We have to replicate the Holy Trinity’s giving. I recommend reading the tracts of Saint Augustine, which you can find on NewAdvent.org. Augustine offers a beautify explanation of how to incorporate the Trinity into our lives. 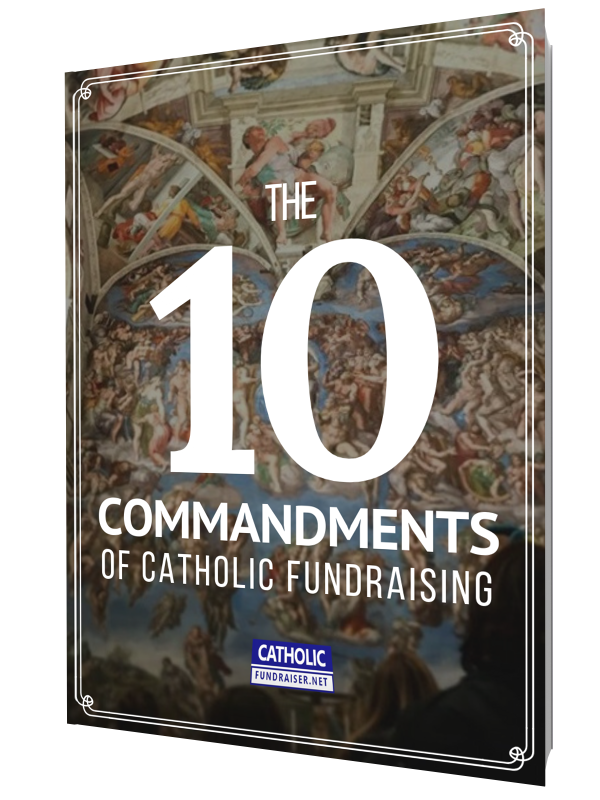 This perspective on fundraising provides me a unique framework which is hugely successful in the Catholic sector. Why? Because Catholics understand the Trinity. They understand giving. I focus on this constant and continuous flow of generosity. Each day, I reflect on how I can give and receive more with my board, colleagues, donors, volunteers, and prospects. I highly recommend you read this article on the 7 ways to increase donors without spending money. Also, you will learn how to take this idea to the next level with The Generosity Factor: How giving is the fastest way to donors. I have learned that I should not wait for others to reach out and connect with me. Rather, I should instigate the initial point of contact. Even if I am scared to do so, I take that leap and contact people. I call them. I meet with them. I reach out to them. I am reminded of Saint Paul’s words, explaining that Jesus died for us when we didn’t even love him. (Romans 5:8). Jesus did not need us, yet he made that first, great move for us. The greatest gift a friend has to offer. (John 15:13). If God had waited for us to get our acts together, I’m not sure anything would ever happen. This is how the Holy Trinity functions. It doesn’t wait on others to give. It doesn’t wait on others to receives. By God’s nature, this is what the 3 in 1 does, over and over again. Therefore, I recommend that you do not wait for others to contact you about your work or to make a donation. I recommend you make of 20 people whom you’ve been waiting to connect with or have hoped would contact you. Find their contact details and reach out to them today. You will find my article on Dream Lists helpful in completing this task. When I made my dream list, I saw immediate results. Reflection and awareness are two of the greatest gifts we have from God. I turn to Saint Augustine again and his profound discourse in exploring this phenomenon of self-knowledge. Augustine explains this concept by viewing a person through the lens of the Trinity. A unitary person functions in three ways: the knower, the known, and the knowledge. You can read more about this on NewAdvent.org: Saint Augustine Tract 15, Book 6. At times, when I am completely focused on my fundraising, I think that I know what I am doing. I also think that I know other people know what I am doing: raising funds for a great cause. However, only when I take the time to reflect that I learn what is working to attract people’s attention, increase my donors, and raise more funds. I used to think that certain events would not produce donations; however, it was after reflection that I learned otherwise. And, I used to think that I had to spend lots of money to attract people to events; however, again, this theory was proved incorrect after reflection. I recommend you do the same. Take the time to reflect what worked and didn’t work this past month. Who donated, and why did those people donate? I also recommend frequently sending surveys to your donors, followers, volunteers, and anyone else connected with you to ask this important question: How well am I serving you? This action is particularly important when you find yourself in a slump in fundraising. Ask yourself, ‘What do I forget to give to my network of donors, volunteers, and contacts?’ I am not saying you must give material gifts to others. Sometimes the perfect gift is a handwritten card or phone call. For more information on this topic, I recommend you read my article on how to build a fundraising plan to guarantee results. How to Build Your Own Fundraising Plan in less than 10 minutes. You may think that fundraising is about raising money, but, in the long term, your success in fundraising is dependent on how well you connect with those around you. That is why reflecting on the Holy Trinity helps keep you focused on the bigger picture. When you find yourself at a crossroads, unsure of what to do next, take a step back and consider how God the Father, God the Son, and God the Holy Spirit interact with one another. It’s by renewing your understanding of how they give and receive between one another that you will find your next step forward. I recommend doing this each week, and, if you keep this habit, you will see, day by day, more success in your fundraising. Question (Leave your comments and questions below): What has the Trinity taught you about relationships, giving, and receiving? We look to the saints for guidance when we find ourselves in a challenging situation. This could happen when we face a family crisis, a confrontation at work, low self-esteem, despair, or simply pondering what to do next. In my life, several saints (Augustine, Liguori, Bernard, John Paul II) have helped me navigate my way through these challenging times. Why not turn to the saints for guidance with fundraising, too? I have discovered stories about how saints inspired others and raised money which I think would be helpful to review. Here are four lessons that I learned from saints about fundraising. I recommend that you be an incredible storyteller because fundraising is all about sharing ideas, building relationships, and inspiring action. Remember, each donation comes from the hands of a person. This person donates when they recognize something special in you. They were motivated to give because you shared a common interest that was important to them. You communicated it in a way that caught their attention and gave them the trust that you would do something great with the money. Saint Alphonsus knew the power of storytelling and the art of connecting with an individual. He’s one of my favorite saints because he captivates my attention through vivid stories, practical theology, clear doctrine, and beautiful prayer. When he shares the story of a saint, he does so with such passion and vividness that I can see the saint in front of me. Incredible. Alphonsus does it all; hence his title as Doctor of the Church. How can you be a better storyteller with your audience? When you share your story, be intentional with each person and interaction, no matter the size of the donation or audience. When you send an email or letter, particularly to a large group, communicate as if you are addressing just one person. And, if the individual cannot give what seems to you a significant amount, be conscious that it is a generous gift in their eyes. Try to see Christ in every person who connects with you. I recommend engaging one on one with your donors, volunteers, and prospects as much as possible. The best way to do so is by blocking time each week to speak with them. Whether you find 30 minutes, 1 hour, or a full day, you should set aside time to connect with people directly. I suggest that you commit to this goal each week for an entire year. After 52 weeks, you will have spoken to several hundred people, and I guarantee among them will be new donors. People will applaud your commitment to stay in touch with them because it is one of the best ways for building relationships and trust with people. People want this in a Catholic organization when considering to donate. Saint Bernard was a master at consistently writing letters and sharing his ideas with people. Maybe this was thanks to the habits he acquired as a Cistercian monk. Saint Vincent de Sales and Saint Ignatius of Loyola also understood the importance of continually communicating at the individual level. They habitually kept people informed of their work, shared their ideas, and inspired people to support them. Their religious organizations directly benefited from their commitment. I follow the example these saints have set. Each week, with my work for Catholic organizations, I set time aside to contact people personally. By doing so, I grow incrementally and consistently their number of donors. This habit also helps build a current list of prospects. Saints do not always ask for things in their letters, which seems to be the opposite of most charities. I recommend taking the saints’ approach by focusing on connecting with people and sharing ideas that will make the reader grow in sanctity. I also think saints would leverage social media and websites to connect with people and share their messages. Take for example Saint John Paul II. What a maverick! He leveraged video and radio to spread Catholic messages and to draw people to the Catholic faith. Again, I recommend sharing and connecting with people rather than using social tools and letters to ask for donations. I have said it already, but the only reason someone will donate to you is if they know you exist and trust you. Therefore, get their attention and build trust. I enjoyed reading Archbishop Fulton Sheen’s autobiography, Treasure in Clay. We are merely pots of clay which pass items from one person to the next. I am amazed how saints, just as Fulton Sheen, accomplished so much through this method: acting as a channel for receiving gifts and then using them to transform the world. They were able to receive gifts, both big and small, to build churches, convents, monasteries, schools, and spread the Gospel to better communities. The saints understood the concept of receiving talents and multiplying them. (Matthew 25:14-30) You do not increase talents by keeping them buried in the ground. Rather, you use the gifts of the Holy Spirit to increase them. Saint Vincent de Paul understood this when he founded the “Ladies of Charity,” a group of women who financially supported his work. Saint Vincent knew how to receive a gift and transform people’s lives. Saint Francis of Assisi also was an incredible ‘receiver and giver.’ I am inspired by his confidence to go into the world and preach about Jesus Christ. He would transform people so much by his witness and words that they would give him gifts, sometimes large ones too. When I visited Assisi on pilgrimage, a fellow pilgrim told me a story about how Saint Francis crashed a dinner party to speak about the Gospel. Moved by his passion and words, the host, who happened to be a wealthy man, offered Francis a relatively large portion of land. Francis happily accepted the offer. He lived on the land and invited people, including thieves and criminals, to live with him under one condition. They had to welcome his way of life: following Jesus Christ. I often reflect how Francis, a man who lived a life of poverty, accepted this gift and transformed so many lives, even mine. There is now a monastery on this land, along with the cave where Saint Francis lived. I lied down for a minute on his bed of iron bars, a transformational moment. As I laid there, hundreds of years after his death, Francis still had the ability to do wonders with this gift of land. For a second, you could say Francis was a wealthy landowner. He, however, knew how to be even richer: by being rich in the eyes of the Lord. Therefore, never back away from your Catholic identity. Like Saint Francis, be bold and proud to called a Christian. God will bless you by placing the right people in front of you. As you prepare for your next fundraising campaign, capital appeal, or look to improve your stewardship, remember how the saints would connect with people, inspire them, accept their donations, and use them to transform the world. Also, I ask that you remember that money is never the direct solution to your problems. Nor will it be the reason you succeed. We can transform the world with it and without it. Money is simply an enabler. When you do fundraise and receive donations, look to the saints for guidance. They didn’t build networks of monasteries, convents, and churches on their own. They were committed to Christ and were always ready to receive more all the while giving even more. Do you have this vision, too? QUESTION: Which saint do you admire, and how can he/she help you with fundraising? These words have a connection to what Saint Paul says in Acts 20:35. If I take my life, for example, I have found the more I practice generosity, the more my relationships with others. As a result, I find the people around me, more often than not, reciprocate this generosity. This concept is also true for a Catholic charity, particularly with its fundraising. Fundraising is quite pragmatic. It is concerned with meeting the budgetary requirements. Money in, and money spent. However, how you execute fundraising is not a simple process of meeting certain conditions. It’s not simply donations received, donations spent. Ask, then receive. Fundraising also means interacting with people. And the best success in fundraising focuses not on the donations but on how you deal with those people: including donors, prospects, volunteers, followers, and anyone else who comes into contact with you. And this is why generosity is so important. Every donation you ever receive comes from the hands of a person. If you focus on the people, not the gifts, you will speed up the number of donors you have. Here are five practical reasons how generosity is a full-proof way for inspiring people to donate to you. I have touched on this concept a few times already, but I think it can never be said enough. Generosity begins with self. If you want people to donate, I recommend that you set the bar and start giving to people. I’ve asked over 20,000 people for donations in my time as a fundraiser, and my experience tells me that each time I demonstrated an ethos of giving myself, the response from others is much higher. So, instead of waiting for people to sign the pledge form, I recommend you kick start the tradition of giving. I wrote an article on seven different ways you can start giving to others (at a very low cost). When you receive a gift, you naturally feel obligated to give in return. Just think of the last time someone gave you a gift. What was your reaction? This is our natural wiring. We are designed to act and think like this because God made us to connect with one another. We are designed to give, allowing others to receive. The act of giving is the transformational element between two people. The gift itself is actually secondary, a bi-product. Giving elevates the bond between people to new heights because we are designed to give, not receive. Therefore, you don’t have to convince someone to give to you. You simply have to remind the person of their divine nature. How do you do this? You nurture the relationships you have with people like you would with any friend or family member. You take notice of who the person is: their passions, desires, fears, joys, doubts, and dreams. By making the habit to be generous to others, they will follow your example. And, the more people you can give to, the more opportunities you have for more donors. The act of nurturing a relationship in the long-term through acts of giving has exponential effects on your fundraising. As Saint Paul tells us, generosity helps relationships matured over time. (1 Corinthians 3:6) Therefore, rather than looking at fundraising as a transfer of money between people, I recommend you view it as an opportunity to plant seeds, nurture relationships, and allow God to grow what He wishes. Often, people ask me how to convert one-off donors to long-term ones. The best method I have found is to nurture the relationship over time, and you do this by continually being generous to those one-off donors. Now, I am not saying you should flood them with pamphlets and donation requests in the mail after their one donation. How often has this happened to you? My suggestion is to be attentive to what inspired the person to donate in the first place. What caused them to give? You can even ask them directly. Then, focus on building a relationship based on this inspiration. Does this method sometimes take time? Yes, but this is just the point. With time, when you nurture a relationship, you also build trust with people who will gradually become donors, one after another. And isn’t that what we want? A long list of faithful, long-term donors that stand by us. Therefore, be patient. If you consistently do this, you will see the fruits of your labor. Many charities have unbalanced giving-receiving cycles because their donors are always asked to give. In return, how often do charities then give in return? Not much in my experience. I don’t recommend doing this because if all you do is ask others to give, you receive much more than you give. And remember, Saint Paul reminds us this is not the recommended way to live. Therefore, you must reset the balance by giving back. You do so by giving your donors the trust, confidence, and commitment that donations are being wisely used. By doing this, you build a loyal donor base who will give again and recommend you within their circle of friends and family members. This concept of balancing your cycle is of particular importance when you want to retain donors. One of the quickest ways to increase your number of donors is by keeping the ones you already have. This is what we call retention. Many charities focus on asking and finding new donors. They spend money on advertisements to attract people’s attention. They run from parish to parish asking for donations. These activities, in my experience, are ineffective for two reasons. First, the best way to increase your donors is to have your current ones recommend you. And second, the best way to increase your current donations is to build the trust within your current donors. Plus, my approach is much easier and less costly. Always remember, a great way to grow your donor base is to retain your current ones while finding new ones. Once you have perfected the first four steps, you are ready to take your fundraising to an even higher level. You do so by making sure that your benefactors are donors are balanced between one another. With the money that you receive from donors, you spend it to accomplish your mission: help the sick, feed the hungry, visit the imprisoned, welcome the lonely, and comfort the dying. You use the money from your donors to help your beneficiaries. You are an intermediary between two people: the donor and the recipient. You are doing fantastic work by fundraising for your charity to help people. However, this model also places both donors and beneficiaries out of balance in the bigger picture of giving and receiving. Just for a moment, I ask that you consider the perspective of the donor and the beneficiary. A donor gives but often doesn’t receive much in return, apart from a thank you letter. The benefactor receives care and resources but often doesn’t give in return. You may think, “Well, donors give to charity because that’s the right thing to do, and the benefactors should not be expected to give. They are not in a position to give”. Yes, they give out of the goodness of their heart. They are philanthropic, but at the same time, they do need something in return. I do not use the word need often, but often, a donor is looking for assurance that their donation has achieved their goal of making a difference. And with regards to the beneficiaries, they want to give because we are all designed by God to give, not just receive. The purpose to living is giving. No matter who someone is, he or she has something to give. Even if the person is going through the most challenging life moment, they have something to give to others. That is why the Catholic Church’s stance on life is so incredible. [Catechism 2270-2273] Catholics see value in each person, no matter their circumstances. Therefore, I recommend that your beneficiaries give, so they feel that they are giving just as much as they are receiving. Ask yourself the question, “How can I make sure those who we are helping are helping in return?” How can they contribute? Most often, they have something to give back to the donors. I was hired by a charity to increase their number of donors. When I first started, I made a list of prospects and called each one to ask for a donation. Whether they had a long-term relationship with the charity or just got in touch, I did not care. I called each one and asked. My strategy was the more asks, the more chances of donations. This strategy did not bear much fruit. My conversion rate (getting someone to donate) was low. Really low. Maybe not even 3%. My results were so bad that I was also afraid to report it to the director and the board. After a few months of low results, I switched my approach. Within a few months, I tripled my results. The number of new donors went up by 350% every month. By the end of the year, we had twice as many donors. And the next year, we doubled again. These are massive results! Just imagine if your current rate of new donors was 20, 50, or even 100. How incredible if you could triple these figures? What additional projects could you start? I recommend you always set the standard for generosity because it is a fantastic way to increase your number of donors. Before asking someone for a donation, ask the question, “Have I been generous to this person?” And, if you want a donor to give more, find a way for the giving to increase from your side. You’ll soon find more major donors among your current ones. QUESTION: What is one way you can be more generous to those around you?